In a post-war era Huw Edwards-Jones would have been dubbed an angry young man, but as a middle-aged furniture maker contemplating his future in the hard winter of 2010 he was not so much angry as resigned to the lot of a maker who refuses to compromise in order to make money. For Huw there has been no family cash to support him, and he is working on his own to keep his wife and three young children on the proceeds from a few choice pieces a year. At 53, he describes himself as a poor person who, when I caught up with him, was taking stock, spending the winter in St Ives, Cornwall, taking a break from his damp but relatively cheap workshop near Eastbourne. At the root of his problems is a dilemma recognisable to many makers, the difficulty of being able to charge enough to equate with the time taken to make something largely by hand. He is not prepared to compromise his integrity by doing by machine what can be done by hand, and also relishes a challenge. He takes a cabinet for which he would charge two thousand pounds as an example and says that equates to the cost of materials, three months of work and the fact that because you are creating something unique, every time you make something you are making a prototype. If it goes wrong and the clients do not pay you the final balance then you go bankrupt. Fortunately, he said, that had never happened to him but it was conceivable. On leaving school Huw joined the Merchant Navy as a trainee navigating officer. He was on a trip, hating the experience, when the ships carpenter said he could use some old mahogany. He started doing bits of woodcarving and really enjoyed it, he recalled, adding that he supposed he was not the military type. What followed was a couple of years apprenticed to restorer AJ Hartnett and antiques specialist Michael Norman, both in Brighton. There he received classical training on fine furniture which gave him the option to do anything. Although out of fashion, he said, antiques gave you an eye for proportion and proportion in furniture was everything. If it was not in proportion it did not look right. It was all mathematical. You could do something unique and modern but it still retained classical proportion. 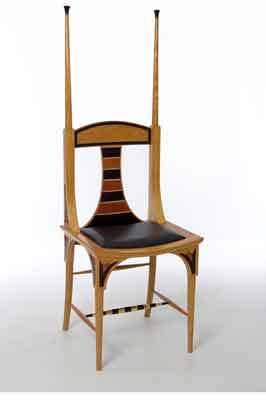 He illustrates his point by talking about an Egyptian-style chair influenced by Tuten Khamun and Art Deco. It was very difficult, he said, and was made out of solid satinwood, now unobtainable, solid pink ivory and ebony with acanthus leaf details on the legs and ivory wood used on the buds. He set up as a restorer then acquired a degree in design before starting his own workshop, doing one-offs. With a string of Guild Marks for his pieces he was attracting attention, and making for celebrity clients. In 1999 he was given two weeks to design and make a present for the wedding of Prince Edward and Sophie Rhys-Jones, a yin-yang fish box. He took 15 minutes to design it and it features two carved interlocking carved coi carp. John Bly of Antiques Roadshow fame and probably one of the top authorities on Georgian furniture, called him, remembers Huw, a modern-day Chippendale and invited him on to his Heirloom TV programme. He is, though, something of a loner. He said he hated networking because a few ambitious people seemed to control everything. He rates himself in the top 10 of makers. John Makepeace, he said, liked his work and he had been told it was inventive and unique. He was less commercial than most. Talking about the cabinet in solid walnut shown here, Huw said that top makers were refusing to make in solid timber because you could not stop it from moving. Robert Ingham had told him that he set his workshop to the humidity of the room it was being made for. His own workshop was like a damp sponge with walls weeping water and he estimated a spend of Â£100,000 to set up a workshop that is humidity and heat controlled in every way. But back to the cabinet and he said he was a traditional craftsman doing everything by hand, but there was no money in it. All those handcut dovetails, he said, saying that decided to hinge the cabinet that opens up like a shelf on exterior barrel hinges - nine barrels on each hinge. All the barrels were turned from solid with a half inch hole down the middle and pin arms with a central hole and of the same diameter as the barrel. The turnings had to be spot on and creating the exact distance was a nightmare. A fillet of pink ivory wood on the tip of each barrel prevented wear. The bureau opens to reveal solid turned walnut bevels to create openings for wine bottles. 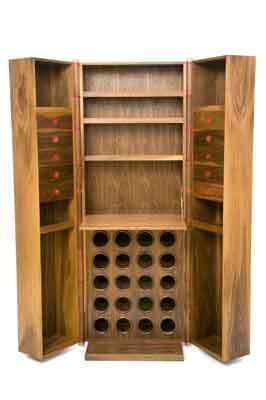 The piece, which also contains wine glass spaces and five drawers, took three months to make. Huw said he was always trying to push the edges of making things so he did it himself because the quality control was there. For the same reason he did not employ anyone. There were lots of skills in that cabinet. The units on the main carcasses were braced and rigid to cut down movement to a minimum. It had to have fixed internal bracings to hold it rigid. He lamented the difficulty of buying solid English walnut, saying that it all went for veneers. It could be obtained in France but usually only from female trees which were not so attractively figured. He did, however, find one male tree of which 50% was usable, and planned to use that to make a second cabinet which would be far superior in figure. He said he always made two of any nightmare piece, making a loss on the first and a profit on the second. There was no money in it anyway, he said. People who did make money were farming work out. There was a difference between maker and master craftsman. There was more soul and sometimes the piece would not be so accurate but it would have more energy coming over because it would have been slaved over. Some of the things he had made had almost killed him, he said, explaining that while you could strive for perfection you could only get close to it because some aspect would go wrong. Something would move or it might just be because a draught came in or a bit of damp. He is always up for a challenge and is currently working on a massive conference table made from Spitfire parts. The project, intended as a memorial to Spitfire designer RJ Mitchell, is in a state of flux because of the difficulty of getting the parts, some of which, Huw says, are like gold dust. Huw is based in the village of Hankham, near Pevensey in a workshop that is so damp that his humidifiers collect half a gallon of water a day. It is 40 x 15ft and equipped with a bandsaw, overhead router, planer/thicknesser and overhead saw, plus good-quality hand tools, and has a wood-burning stove at one end. He can be contacted on 07835 094508.